Great paper published by Tommaso Jucker et al. : Remote sensing is revolutionizing the way we study forests, and recent technological advances mean we are now able – for the first time – to identify and measure the crown dimensions of individual trees from airborne imagery. Yet to make full use of these data for quantifying forest carbon stocks and dynamics, a new generation of allometric tools which have tree height and crown size at their centre are needed. Here, we compile a global database of 108753 trees for which stem diameter, height and crown diameter have all been measured, including 2395 trees harvested to measure aboveground biomass. 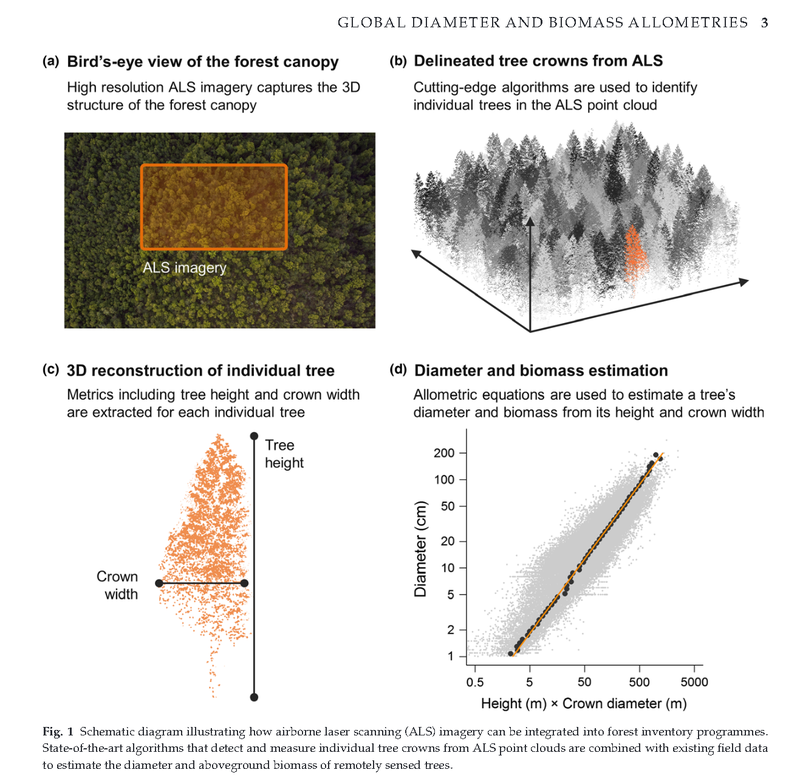 Using this database, we develop general allometric models for estimating both the diameter and aboveground biomass of trees from attributes which can be remotely sensed - specifically height and crown diameter. We show that tree height and crown diameter jointly quantify the aboveground biomass of individual trees and find that a single equation predicts stem diameter from these two variables across the world’s forests. These new allometric models provide an intuitive way of integrating remote sensing imagery into large-scale forest monitoring programmes and will be of key importance for parameterizing the next generation of dynamic vegetation models. Jucker T, Caspersen J, Chave J, Antin C, Barbier N, Bongers F, Dalponte M, Ewijk K, Forrester D, Haeni M, Higgins S, Holdaway R, Iida Y, Lorimer C, Marshall P, Momo S, Moncrieff G, Ploton P, Poorter L, Abd Rahman K, Schlund M, Sonké B, Sterck F, Trugman A, Usoltsev V, Vanderwel M, Waldner P, Wedeux B, Wirth C, Wöll H, Woods M, Xiang W, Zimmermann N, Coomes D. 2016. Allometric equations for integrating remote sensing imagery into forest monitoring programmes. Global Change Biology: 10.1111/gcb.13388.